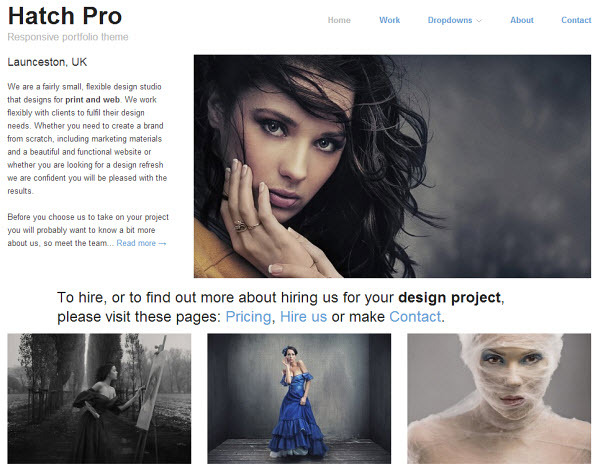 Are you a freelancer or designer that uses WordPress for your portfolio? Even though WordPress is mostly used to run blogs, it can also be used for many other types of websites such as business websites and portfolios. Best of all, there are many portfolio themes available for you to choose from. As a freelance writer or blogger, you may want to showcase the places or blogs where you write. 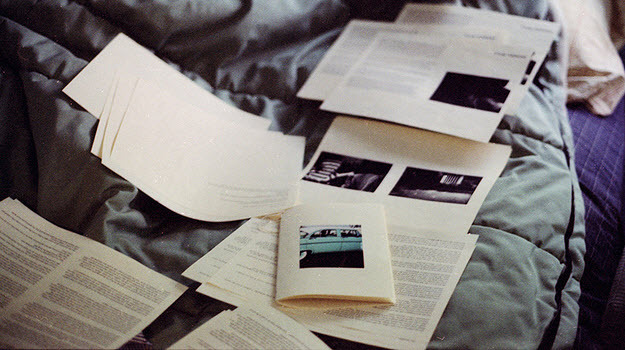 You may even want to show off some of your best articles or blog posts. 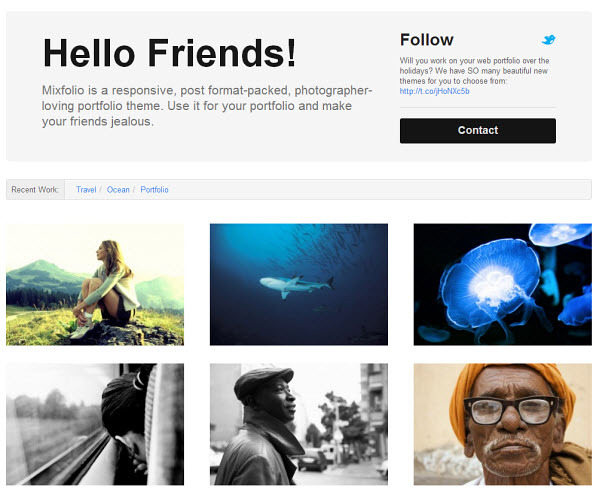 Portfolio themes are great for this! As a designer, you’ll have lots of artwork and designs to show off as well. Some portfolio themes for WordPress are simple and elegant, others are bright and stylish, and then there are some that are really bold and unique. Whatever your preference, you’re sure to find one that you like within these 8 free portfolio themes for freelancers and designers. Hatch is a minimalistic portfolio theme that puts your work at the front and center with three rows of thumbnails on the home page. 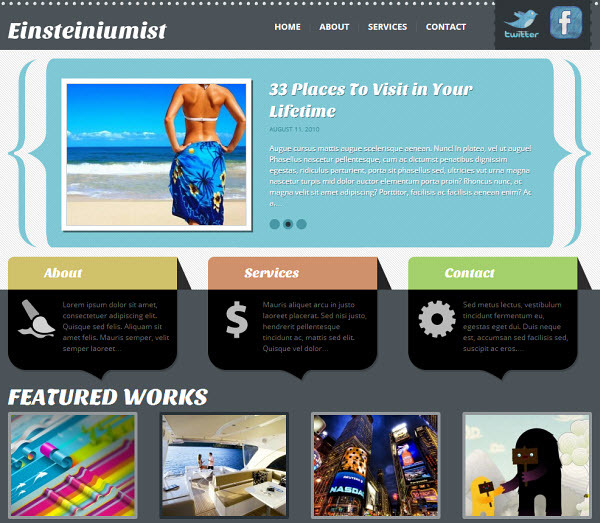 It has a responsive layout, advanced widgets, theme settings, lightbox effect for galleries, and much more. Hatch Pro is an advanced version of Hatch (listed above) and is also minimalistic. The three rows of thumbnails on the home page are much larger, and unlike the original Hatch, there isn’t a widget-enabled footer. Hatch Pro is also responsive like Hatch. Plus, it has the option to switch from a two-column to a three-column layout. In the original Hatch theme, the subsidiary sidebar can only hold up to three widgets, but in Hatch Pro it can hold up to four widgets. Mixfolio is almost like a modern version of Hatch Pro (listed above). There are three rows of large thumbnails on the home page and no widget-enabled footer. In the header of the theme, you can display your latest tweet, and there’s a large contact button which is sure to come in handy. Mixfolio’s grid-based layout is great for showcasing your portfolio. 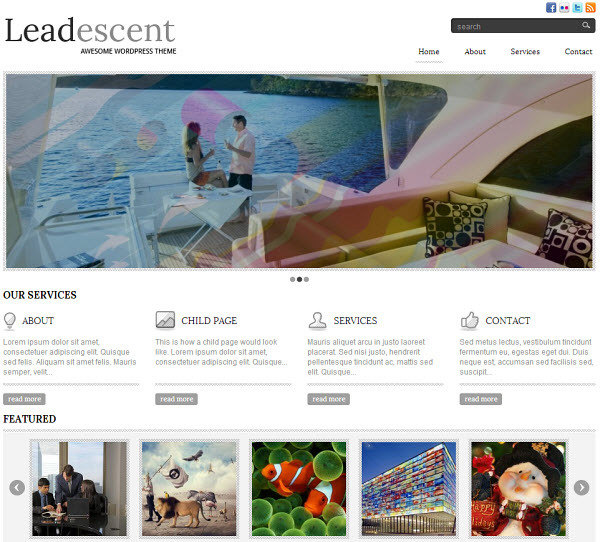 The theme is also responsive, includes various post formats, has a theme options page, and includes page templates. As the name implies, Grid is a portfolio theme with a grid-based layout. As you scroll over each thumbnail on the home page the title, post excerpt, and categories appear; this neat effect is almost as if you’re flipping over a card. Grid also features social media icons at the top, right next to the search box. This is a nice touch and will let your visitors easily connect with you on Twitter, Facebook, Google+, and Pinterest. 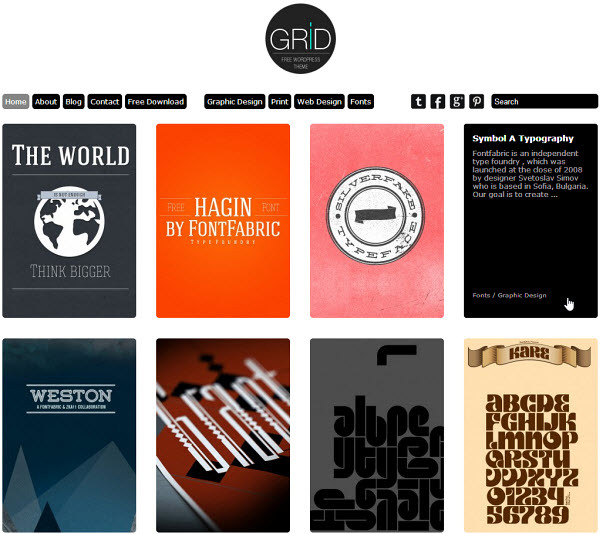 Grid is responsive, includes an infinite scroll feature, and includes theme options. 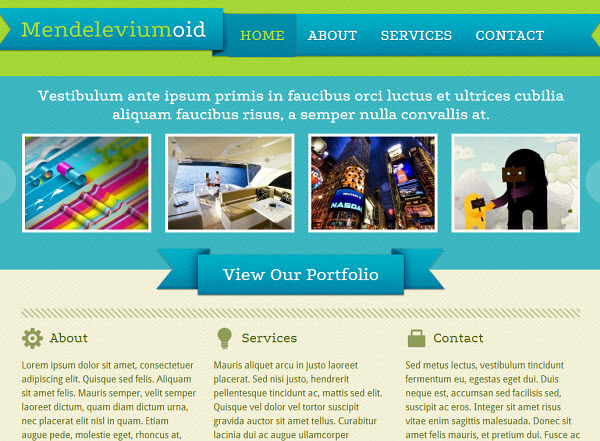 Mendeleviumoid is a bright and stylish portfolio theme that features a Jquery slider, custom fonts, social sharing integration on each post and page, automatic thumbnail resizing, Google Analytics integration, advertising blocks, and more. As you can see, you won’t need to add too many plugins since many important features are already included. Mendeleviumoid’s slider is great for displaying your latest work. You can also add three page previews right below the slider, so that your visitors can learn more about you, your services, or anything else you’d like to feature there. Below that, your latest blog posts (should you choose to include one with this theme) are displayed with large thumbnails, titles, meta information, and excerpts. Einsteiniumist was created by Padd Solutions, the same creators of Mendeleviumoid, so it includes all of the same great features. Einsteiniumist has a unique design with a lot of different colors. The theme contains the following: large social icons for Twitter and Facebook in the top navigation; a featured slider at the top for your latest blog posts; a place to showcase three of your pages (i.e. About, Services, Contact); a featured works (portfolio) area with two rows of thumbnails; and a large contact area at the bottom of the page, which includes a contact form. 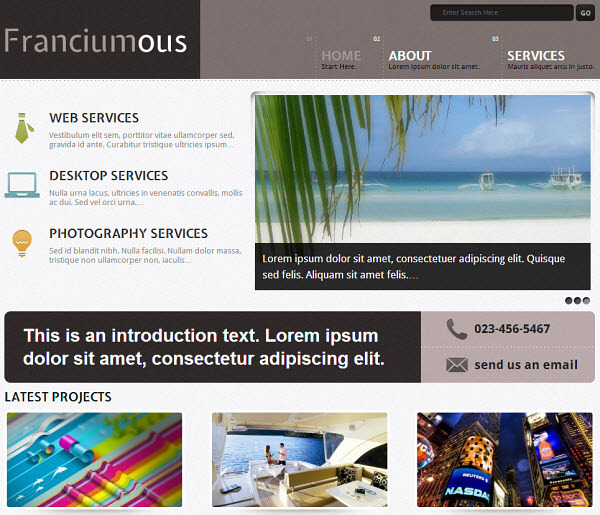 Franciumous is another Padd Solutions theme with a Jquery slider, built-in contact form and background color selector, along with the rest of the great features that are included in all of their themes. Franciumous also features a unique layout, although a bit more minimalistic compared to the others from Padd Solutions. You’ll notice that the area to showcase three of your pages is actually beside the slider, at the top of the page. Underneath that is a place to write an introduction, and you can provide two methods of contact (phone and email). There’s also two rows of thumbnails to display your latest projects and a contact form at the bottom of the page. If you’re looking for something a bit more minimalistic and less colorful from Padd Solutions, Leadescent is a great portfolio theme to use. You’ll get all of the same great features along with a Facebook Like box and featured content manual slider in the middle of the theme (in addition to the large featured slider). You can showcase four of our pages right below the featured slider; the title of each page is complimented by a descriptive icon (as seen in the screenshot). The widget-enabled footer lets you add things like your latest blog posts, recent Twitter posts, and more. 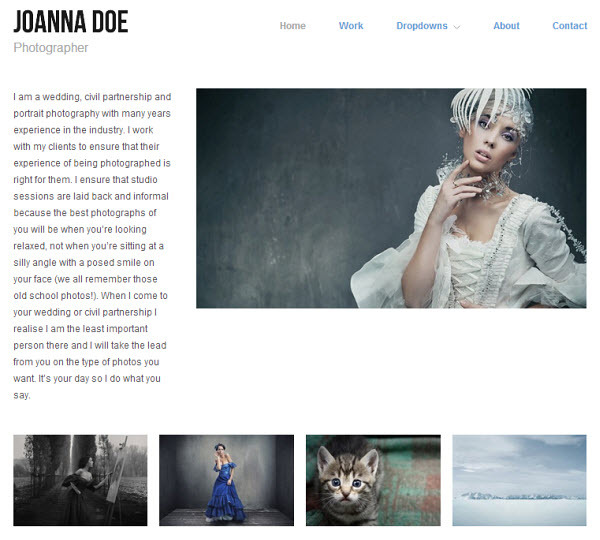 As a freelancer or designer, do you use WordPress to show off your portfolio? If so, which theme are you using? Is it a free or premium theme? Great Collection. Really helpful to setup my portfolio. The best collections for wordpress themes …www.finestemplates.com…www.finestemplates.com.www.finestemplates.com.www.finestemplates.com.www.finestemplates.com.www.finestemplates.com.www.finestemplates.com.www.finestemplates.com.www.finestemplates.com.www.finestemplates.com.www.finestemplates.com.www.finestemplates.com. Thanks for the list :)..however I was expecting a few more portfolio themes.. Thank you for you so much informative blog.Being a freelance using wordpress it will help me a lot.